Paramore is an American rock band that was formed in Franklin, Tennessee, United States in 2004. The band currently consists of Hayley Williams (lead vocals/keyboard), Jeremy Davis (bass guitar) and Taylor York (lead guitar). The band have released three studio albums in total; All We Know Is Falling (2005), Riot! (2007) and Brand New Eyes (2009). In 2002, at the age of 13, vocalist Hayley Williams moved to Franklin, Tennessee, where she met brothers Josh and Zac Farro while attending private school. In 2002, at the age of 13, vocalist Hayley Williams moved to Franklin, Tennessee, where she met brothers Josh and Zac Farro while attending private school. Prior to forming Paramore, Williams and bassist Jeremy Davis took part in a funk cover band called The Factory, while the Farro brothers had practiced together after school. Paramore was officially formed in 2003. The band's first song written together was Conspiracy, which was later used on their debut album. John Janick, CEO and co-founder of the music label Fueled By Ramen, got a hold of Paramore's demos and went to a Taste of Chaos performance in Orlando, Florida to see the band perform live. After a smaller private performance at a warehouse, the band was signed to the label in April 2005. Paramore traveled back to Orlando to record their debut album All We Know Is Falling, which took three weeks to record. The album was released on July 26, 2005, which reached #19 on the Billboard Top Pop Catalog and #30 on the Billboard's Heatseekers Chart. It was certified Gold in Australia, the UK and the USA. Pressure was released as their debut single on July 26th, the same day as the album, which failed to reach the main chart, but reached #62 on the US Billboard Hot Digital Songs. The second song from the album, Emergency, was released on October 16th 2005. The third and final single from All We Know Is Falling was All We Know and it was released February 21st 2006. Paramore began recording their second album Riot! in January 2007. Releasing the album on June 12, 2007, it entered the Billboard 200 at #20, peaking at #15, and sold 44,000 its first week in the United States. The album entered and peaked in the UK album chart at #24. It was certified Gold in Australia, Finland, Ireland, Japan, Mexico & New Zealand and Platinum in the UK and the USA. The first single from the album, released on June 21, 2007, was Misery Business. The song entered the US Billboard Hot 100 at #99, peaking at #26. It also peaked at #17 on the UK singles chart, making it their first charting single in the UK. The second single from the album, Hallelujah, was released on September 18th 2007 and peaked on the UK singles chart at #139. Crushcrushcrush was the third track from RIOT!. It was released on November 21st 2007 in the US and late January ?08 in the UK. It peaked at #4 on the US Billboard Hot Modern Rock Tracks, #4 in the Finnish charts, #54 on the Billboard Hot 100 and #61 on the UK singles chart. The fourth and final single from the album, That&rsquo;s What You Get, was released on March 24th 2008. It peaked at #35 in New Zealand, #55 on the UK singles chart, #66 on the Billboard Hot 100 and #92 in Canada. Paramore wrote two songs for the first movie in the Twilight series. The lead song from Twilight, Decode, was released by Paramore in mid-November in the US and mid-December in the UK. It peaked at #9 in Finland and #15 in New Zealand, their highest charting single there so far, #33 on the Billboard Hot 100 and #52 on the UK singles chart. The other song written for Twilight was called I Caught Myself. Paramore's third studio album, Brand New Eyes, was released on September 28th 2009. It has peaked at #1 in Australia, Ireland, New Zealand and the UK. It has also reached #2 in Brazil and the USA, making it their most successful album to date. It was so far been certified Gold in Australia, Brazil, Canada, Ireland, Japan, New Zealand, the UK and the USA. The first single, titled Ignorance, was released on July 7th 2009 for digital download and on September 14th 2009 in the UK. It has peaked at #1 on the UK Rock Chart, #14 in the UK singles chart, #35 in Australia, #67 on the Billboard Hot 100 and #96 in Canada. Brick by Boring Brick was the second single from the album, released November 23rd, 2009, and peaked at #2 on the UK Rock chart, #28 on the US Billboard Rock Songs, #29 in New Zealand and #85 in Australia. 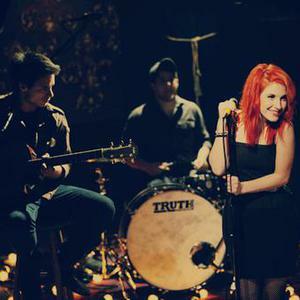 The third single was scheduled for release on April 19, 2010 and is titled The Only Exception. In 2010, guitarist Zac Farro and drummer Josh Farro left the band. Earlier in 2011 they toured South America as they promise and said they'll come later that year with new material for their fans. They released a demo of the song 'In The Mourning". During the summer, a song called "Monster" was featured in the new Transformers: Dark Of The Moon motion picture soundtrack, the song came out with a music video. It was known through a post from Hayley Williams that they'll be releasing new material for their fans and only in mp3 format in the last months of 2011. As it was said, they released "Renegade" which was first played during the FBR 15th Anniversary, "Hello Cold World" a song that contains a different vocal power from Williams that is not usual in her previous work, and the full studio version of the demo "In The Mourning". Their new album is expected to be released during 2013.